Moving time: 6 hr 43 min. Wind: calm for the first 20 miles then the wind kicked up from the south at 10 mph (mostly crosswind but tailwind for 30 miles). Weather: 75°F (24°C) in the morning; got up to 92°F (33°C) by the end of the ride at 3:30pm. Just like yesterday but a little more sun and a little warmer. Humid and partly to mostly cloudy skies. More Kansas today. I spent much of the day in the Flint Hills region. I did a little more climbing than yesterday and ended up over 500 feet above my starting point. This is the fourth highest net climb day of the trip. The grades are not bad - none more than 5% or so. People around here continue to be proud of their hills and let me know it with warnings of the "steep" climbs ahead. These people need to see the Appalachians. 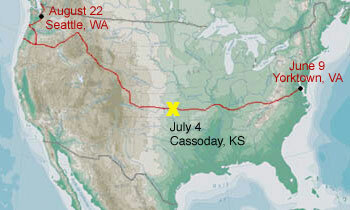 I am 116 miles ahead of schedule - that's almost two days. I'm pleased with my progress so far and feel much better at the end of a long day than I did two weeks ago. I'm getting the hang of this touring thing. There was a bridge being replaced in Benedict, Kansas on the regular TransAm route. The detour includes six miles of gravel roads. 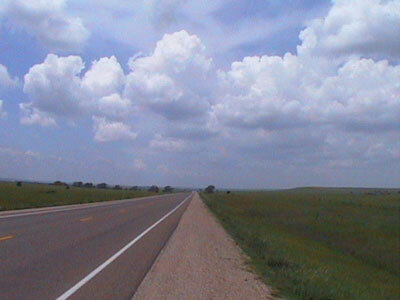 Instead, I took US 75 north to Yates Center and then got back US 54 where I met back up with the route before Eureka. It turned out to be about the same distance as the regular route but went through a town instead of the middle of nowhere. I saw two other westbounders go by when I stopped for a danish and something to drink in Yates Center at a convenience store. I never met back up with them - I have no idea where they went to and I doubt they rode so fast that I couldn't catch up to them over the next 50 miles. Today was sort of an aviation kind of day. I chatted for a while with an Al Allison at the convenience store I stopped at in Yates Center. Al is retired now but spent much of his life selling two models of kit helicopters, the Executive and the Scorpion. We talked for a while about his career and other things. Later, when I ended up in Cassoday, I talked with a man who is an MD-80 captain for American Airlines based out of St. Louis. We talked for a little while about aviation and I told him about my trip. It turns out that he's originally from Erie, Pennsylvania and went to Penn State University. What a small world. The landscape around here is stunning. 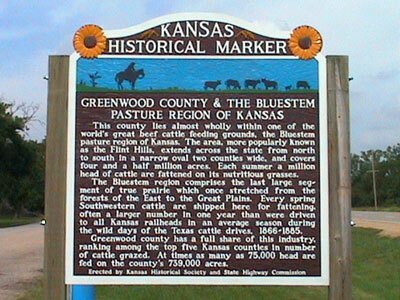 The grass is much greener and very lush as compared to the prairie of western Missouri and extreme eastern Kansas. 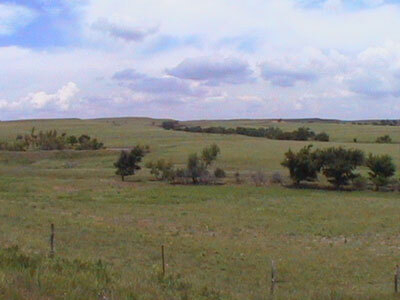 They also don't have farms here - they have huge ranches that extend for miles and miles. 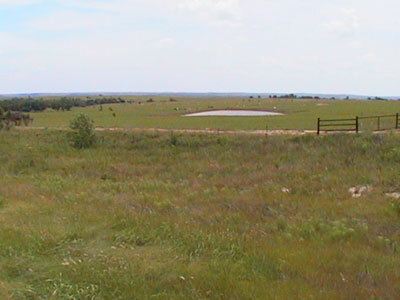 Another common sight are the numerous oil wells that dot the landscape. 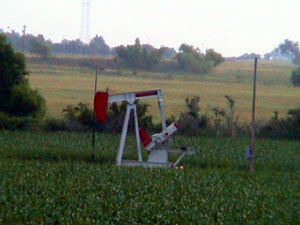 The great plains contain some of the richest oil fields in our nation. 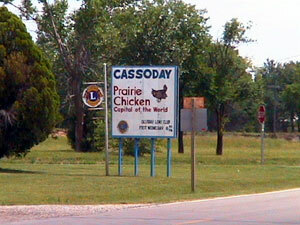 My day ended in Cassoday, Kansas (Population 120) which claims to be the "Prairie Chicken Capitol of the World." Funny, I haven't seen any prairie chickens yet and this town is tiny. I met Joe Deely and Geert Scholte at the park tonight. They pulled in about an hour after me. 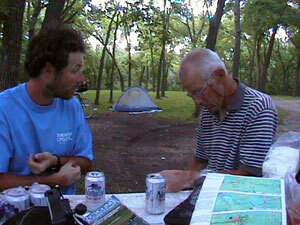 We set up camp, got acquainted, and decided to ride together. Joe, a high school English teacher, is from Virginia and Geert, a retired telecommunications consultant, is from the Netherlands. I've been chasing both of them since the beginning of the trip; Joe started in Yorktown on June 8th and Geert started on June 7th. I started on June 9th. It seems that every log book I signed had their names as the last entry so I was curious to meet up with them. They are great guys and we will ride together at least tomorrow. Perhaps we'll ride even longer.